Enormous heights, sharp turns, stomach-lurching drops… These are only part of the fear and excitement involved with riding a roller coaster. How exactly do roller coasters work, and what psychological effects do they have on those who choose to ride them? There is a significant amount of physics involved in the operation of roller coasters. 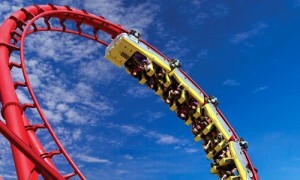 In short, the energy of a roller coaster is always changing. As a roller coaster climbs up a large hill, it builds up what is known as potential energy. The coaster’s potential energy reaches its maximum at the top of the hill. This energy is then released when the roller coaster descends; at this point in time, it is known as kinetic energy. Throughout the process in which the roller coaster is climbing and descending, gravity is constantly pushing downward on the cars of the coaster. An article on HowStuffWorks further explains the complicated physics behind roller coasters. Click here to view an animation that illustrates the changes in potential and kinetic energy. Although the physics behind roller coasters is extremely interesting, I found the psychological aspects of the ride to be much more intriguing. I have always wondered, why are we attracted to the thrill and fear that roller coasters tend to provide? According to Frank Farley, a psychologist at Temple University, many of those who enjoy riding roller coasters experience an otherwise stressful or strictly-controlled lifestyle. For many, the coaster is capable of providing an escape… A break from the monotony of daily life. Other psychologists suggest that riding a roller coaster is an experience in which riders can challenge themselves. At the conclusion of the roller coaster, the rider may feel as if they have accomplished something, such as overcoming a deep fear. It is often difficult for us to challenge ourselves and escape our comfort zone. However, although it may be extremely frightening during the process, riding a roller coaster is ultimately a safe way to challenge ourselves. Lastly, many are attracted to roller coasters simply because they are naturally thrill-seeking. Many enjoy the sensation of the adrenalin rush that comes with riding a roller coaster or other amusement park rides. For many, the concept of “controlled danger” is appealing. It has also been proven that many are even more attracted to the feeling that occurs after the roller coaster concludes. A hormone known as noradrenaline is released in order to restore the body back to normal, resulting in feelings of pleasure and peace. For many, roller coasters are a bonding experience. Whether one chooses to ride with a family member, a friend, or a significant other, sharing the thrill-packed experience of a roller coaster can bring people closer together. Riding a roller coaster demonstrates a variety of concepts in physics and psychology. It is clear that roller coasters are capable of serving as a valuable and positive experience for riders around the world. This entry was posted in Uncategorized on September 19, 2014 by Abigail Mcleod Nelson. I’ve never been a fan of roller coasters but the physics behind them is very interesting. They need to make sure there isn’t too much force on the people in the ride. Just the right amount of pressure is what makes the ride fun and exhilarating. Wow I thought this blog was extremely interesting. As a person who loves to go on roller coasters I thought it was extremely interesting to hear about the physics and psychological side to them! Wow, I never really thought about the science involved with riding on a roller coaster. So I learned something new. I myself ride roller coasters for the thrills but now I will start to pay attention to the bigger picture. For the psychological side I would have to say that I disagree with the experts. I disagree with them because I have never got on a roller coaster for a sense of an accomplishment. I also have not known anyone who expressed that reason to me as well. I think the main reason would be for the excitement and adrenaline rush as mentioned. The mentioning of potential and kinetic energy brings back memories of high school. But what about the G-force. How does the G-force impact someone’s decision to ride on a roller coaster? I completely agree with the bonding experience part because I always need a partner when getting on a roller coaster despite being unafraid. Also, I believe the psychological part may be the feeling of more so being without control. The unexpected drop when you reach the top and the lacking ability to control the speed is what makes people love roller coasters. We all like to believe that we are in control of what happens around us at all times but for those 3 minutes of being in a roller coaster you get to just let everything go and enjoy the ride. I definitely agree that after finishing a ride on a roller coaster, that it is a relief of over coming a fear. I never used to like roller coasters, but after riding my first one, I love them! The physics and engineering behind building roller coaster are so interesting. I am interested to find out how people figured out how to build them and what was the first one that they built. The physics behind roller coaster is truly amazing. I am a huge fan of them, but never really understood why we pay money to put our life at what seems to be like a big risk. The best thing i enjoy about roller coasters is the people you get to experience it with, like you mentioned in your article.